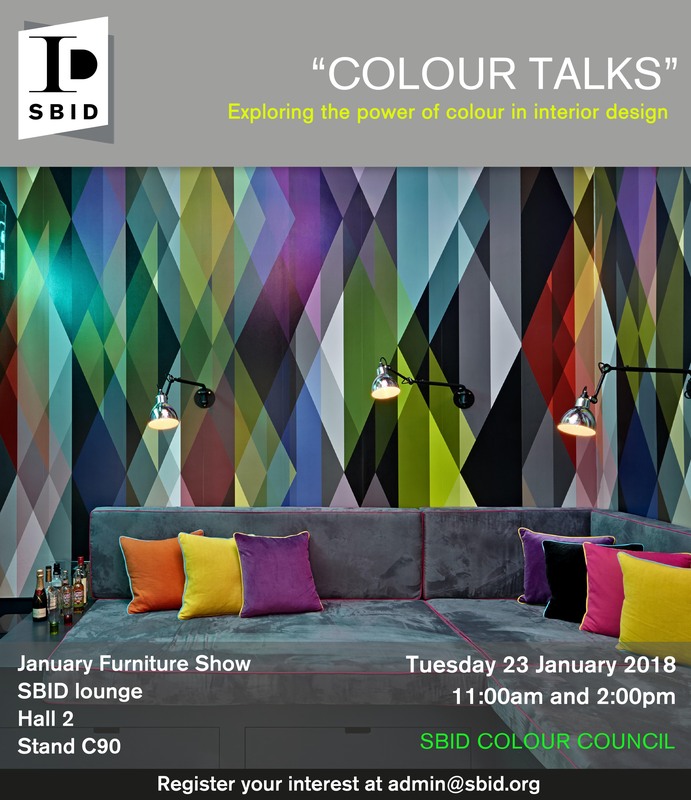 SBID will be hosting a series of talks at the January Furniture Show on Tuesday 23 January 2018. “COLOUR TALKS” is the first in a series of seminars held by the SBID Colour Council which explores the power of colour in our everyday lives. Starting off the session 11am will be an SBID Accredited CPD Seminar called Light and Colour hosted by Franklite Ltd. With a wealth of experience within the lighting industry, the CPD highlights the vital role that lighting plays in interior design which extends far beyond the practical aspects of lighting up an area. It examines various lighting technologies and the human response to shades of white light. Colour temperature and colour appearance are all considered, along with the means of measurement and values associated with artificial light. The CPD is worth 2 points for SBID members. At 2pm, co-chairs of the SBID Colour Council, Carolina Calzada Oliviera and Neil Edwards, will share in-depth insight on the topic of colour and its impact on well being in interior design. As a forum for knowledge, research and education in all aspects of colour, the council aims to gather the best colour experts in the world and cover everything from history to trends, costs to benefits, well being and productivity. SBID Colour Council will be your way to connect to the best colour experts the industry has to offer. Guest speakers will include applied Colour Psychology expert Justine Fox who will present Considering Colour: The Branded Environment and Marianne Shillingford, Creative Design Director at Dulux will shed light on Colour for Smarter Spaces.